Our dance out this week was unusually on a Monday, the 23rd of June. 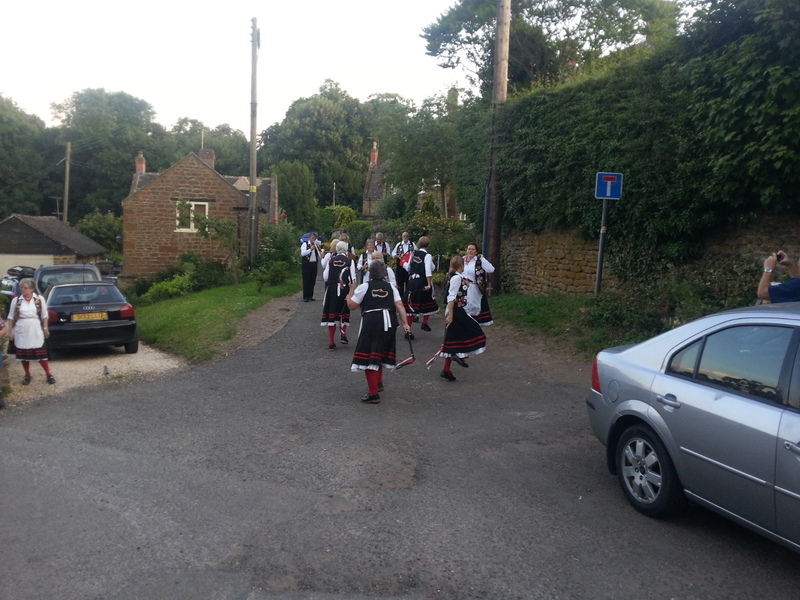 We were a little to the west of Banbury, at the Stags Head, Swalcliffe, with Masons Apron. It was the day after midsummer, and a near perfect evening. Masons Apron at the Stags Head, Swalcliffe. Constant Billy at the Stags Head, Swalcliffe. And after the dancing was finished, Masons Apron produced CAKE! Mmmmm. Masons are famous for their cake. This entry was posted in Dance Outs on June 26, 2014 by Jim Hague. Back on home ground, Sunday 15th June saw us at Wittfest, a small free charity music festival that’s a fixture on the Havoc calendar. We were, as usual, dancing on the grass outside the concert tent. 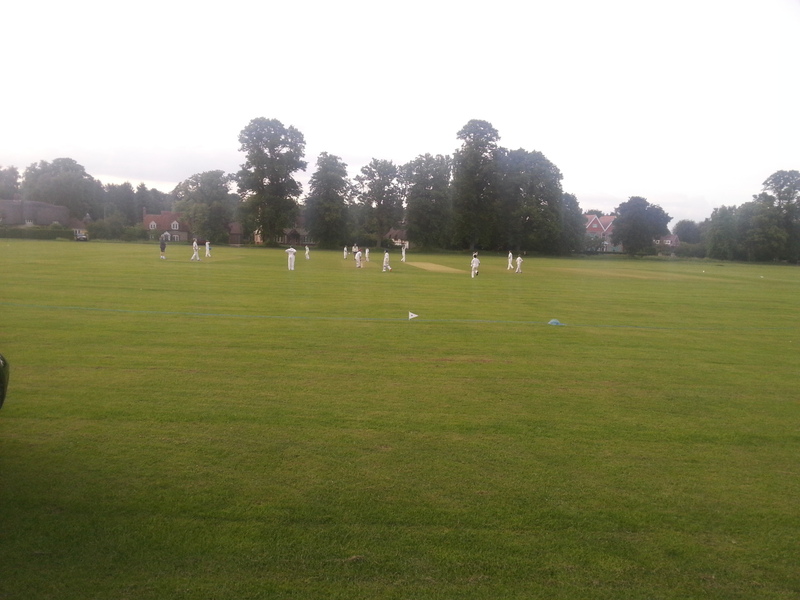 Luckily the weather had been dry. We’ve discovered in the past that dancing is hard work when the going is soft. Even with firm ground, when grass is involved a stick doesn’t make much noise when it hits the ground. Cries of ‘Bang!’ were added to give on-lookers a clue as to the usual procedure. 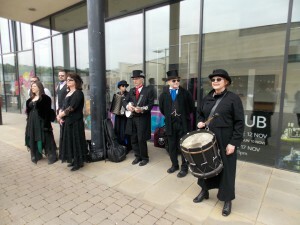 Havoc musicians were augmented by a small extra, Steve and Audrey’s grandson Ethan. Steve and Audrey’s grandson Ethan appears in kit. 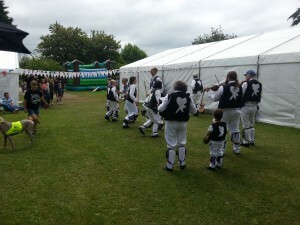 This entry was posted in Dance Outs, Folk festivals on June 26, 2014 by Jim Hague. 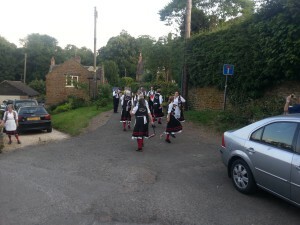 The weekend of the 6th-8th June saw a determined chunk of Havoc make the long trip to Cornsay Colliery near Durham to join our friends at Kern Morris of Durham for their Weekend of Dance. 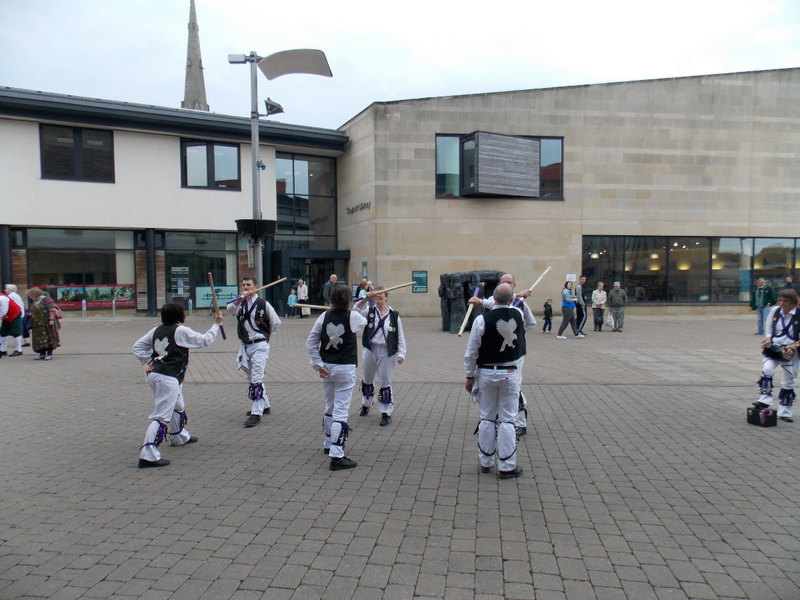 After travelling up on the Friday, we got down to business on Saturday morning in Durham city centre. Balance the Straw at Millennium Place, Durham. There were about 11 sides present. 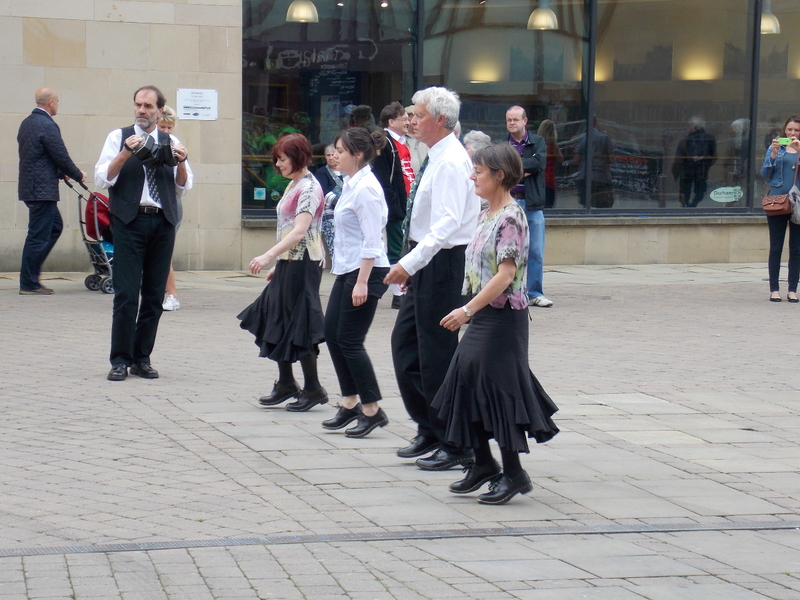 We all did a dance together before most of the others headed off to other part of the city centre. Our first spot was in Millennium Place, so we stayed put with Claro Sword and Morris, Clogarhythm and Whitby’s very own Jet Set Border Morris. 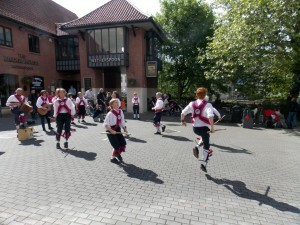 Jet Set Border Morris at Millennium Place, Durham. Clogarhythm in Millennium Place, Durham. After a few dances, it started to rain. So we moved on to our next spot, outside the Cathedral. 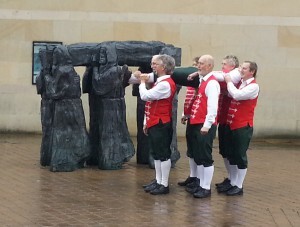 Claro Morris try carrying St Cuthbert. Unfortunately the rain didn’t let up. Havoc don’t let a little water spoil our high spirits. 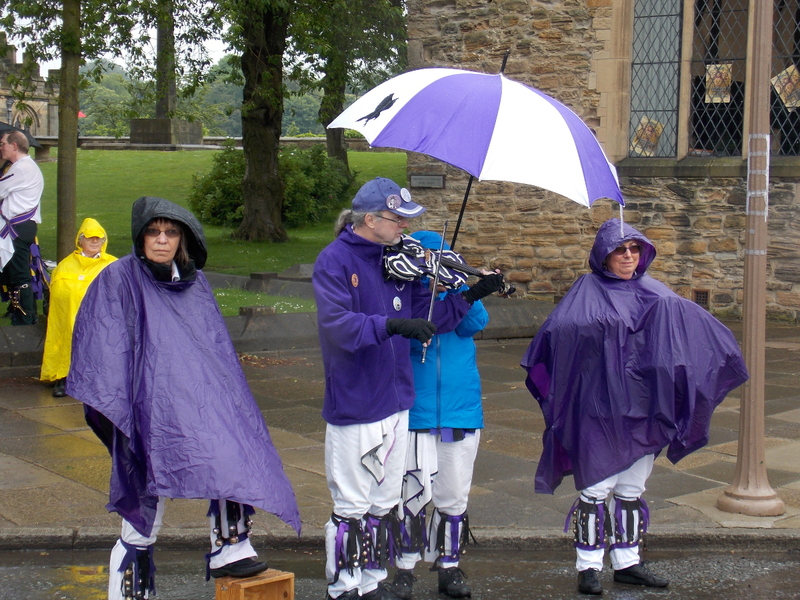 Musicians just love it when it rains, Durham. 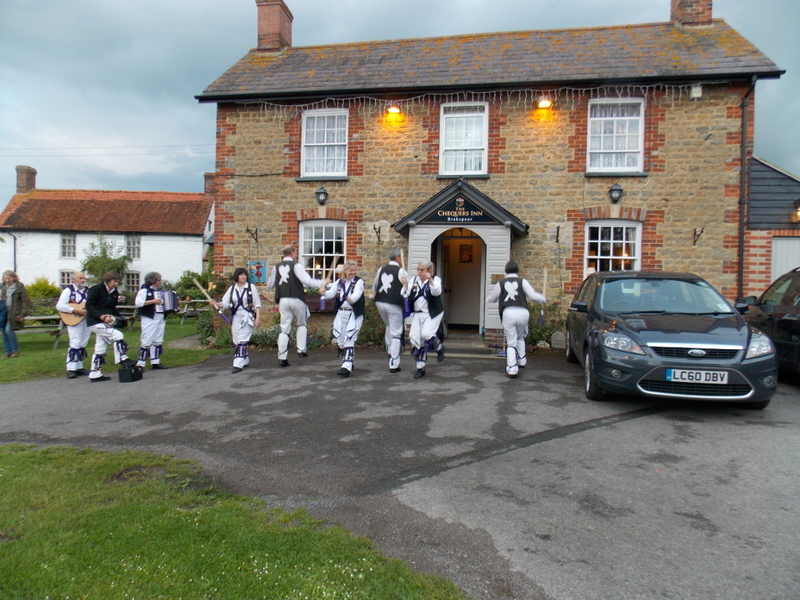 After that, we all hid in a pub for lunch. And, as the rain continued, for the afternoon. Mick Onions is worried about the amount of headroom. 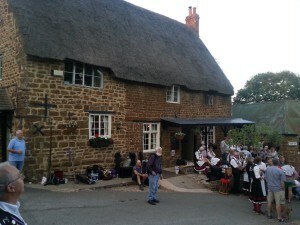 Luckily the weather lifted a little in the evening, and with the encouragement of the pub customers more dancing happened. Come Sunday morning the sun came out properly. 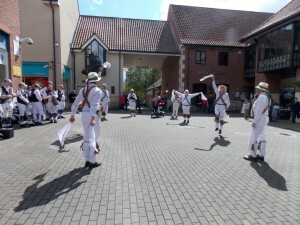 Kern Morris outside the Royal Oak, Cornsay Colliery. 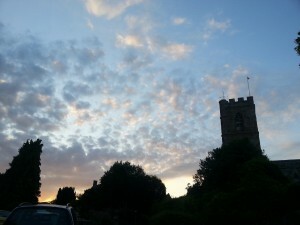 It was a long way home…. 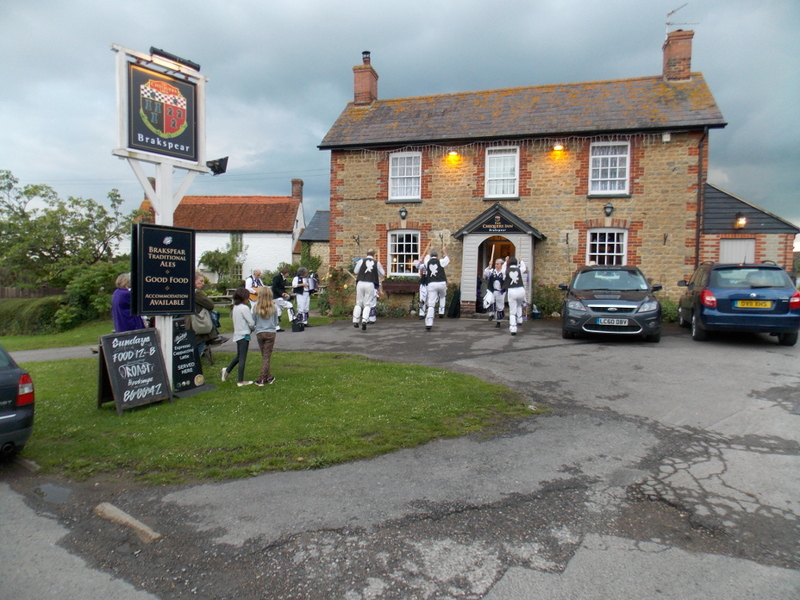 The Prince of Wales has been a regular venue for Cry Havoc over the last five years, thanks to the great welcome we always receive from Phil and Karen – and the top-notch beer! Sadly, Phil and Karen will be leaving the pub at the end of the month. 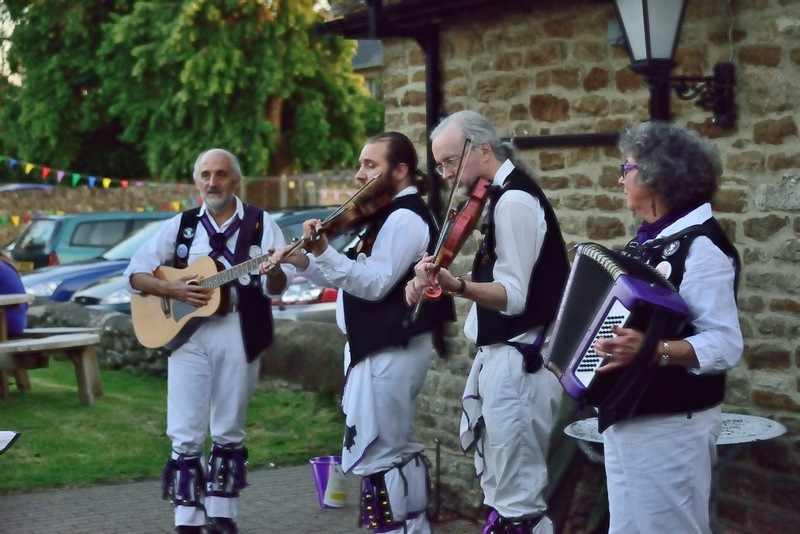 To show our appreciation for their hospitality and support, we were there on Thursday not only to dance, but also to present a cheque to Phil’s chosen charity, Helen & Douglas House. It’s not quite farewell yet, though: we’ll be back at the Prince of Wales for Phil and Karen’s last weekend! 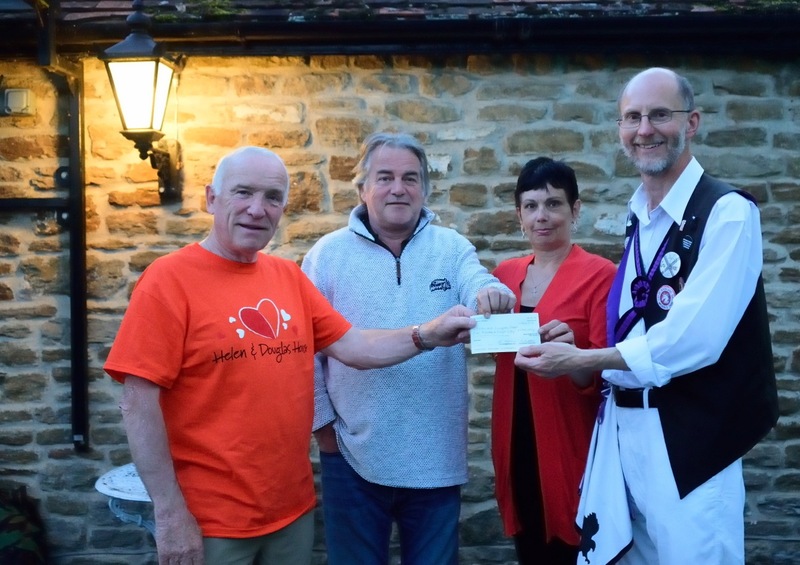 The Squire, Phil, and Karen present a cheque to Peter West of Helen & Douglas House. This entry was posted in Dance Outs on June 16, 2014 by Mick Phillips. 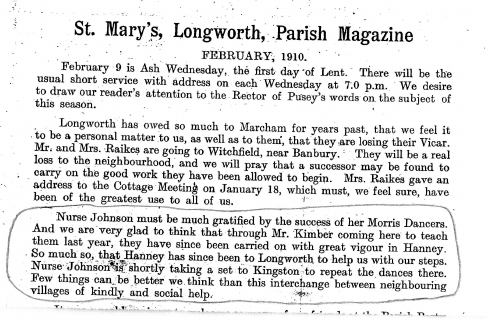 Our Charney Bassett correspondent has found an interesting snippet from the Longworth Parish Magazine for February 1910. 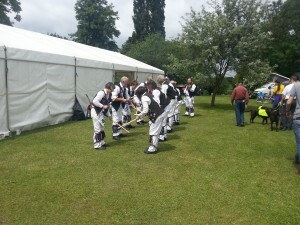 William Kimber teaching Morris in Hanney and Longworth. 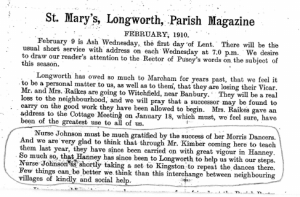 So, it looks like that not only was there a womens’ side in Hanney and a side in Longworth, but that they received instruction from none other than the famous William Kimber. I’m guessing from the piece that these were both sides set up during the folk revival of the early 20th century. Further information welcome! This entry was posted in Dance Outs on June 16, 2014 by Jim Hague. 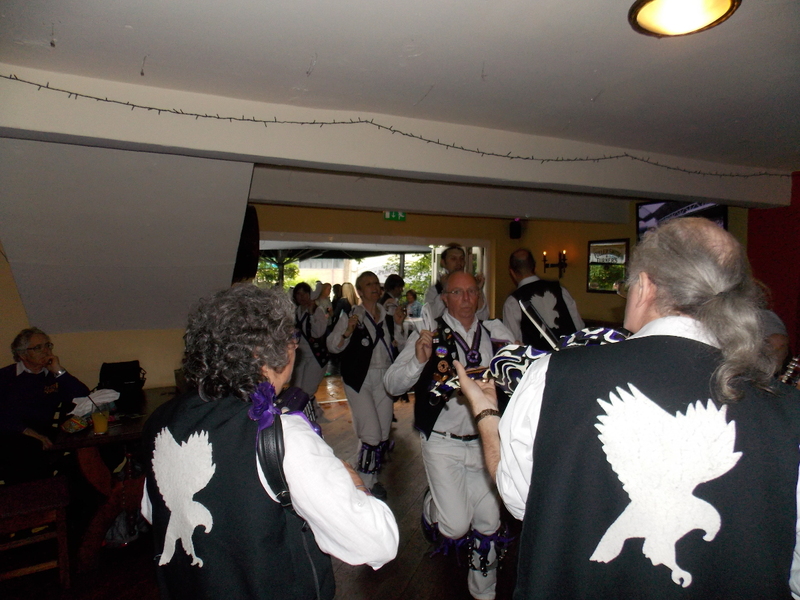 Our first dance out of June saw us at the Six Bells, Warborough, with North West Clog side Old Speckled Hen. It was a fine summer evening, and the old thatched inn and the cricket match in progress on the adjoining field felt like a Tourist Board Merrie England picture. 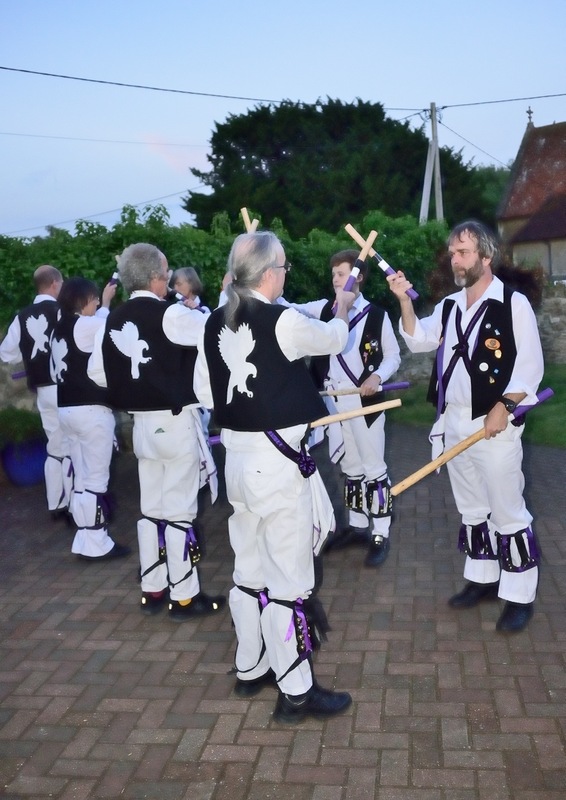 This entry was posted in Dance Outs on June 15, 2014 by Jim Hague. 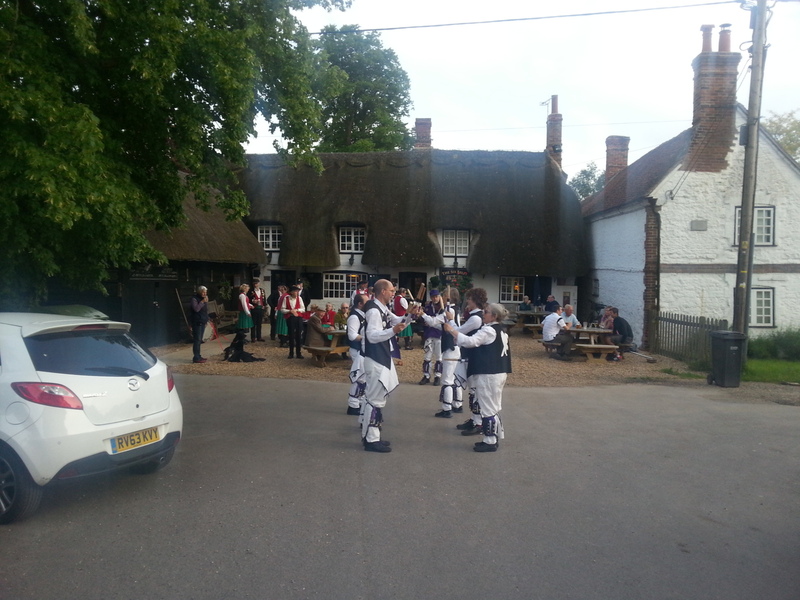 Back from the hurly-burly of the Chippenham Folk Festival, our excursion on May 29th was to The Chequers, Charney Bassett. 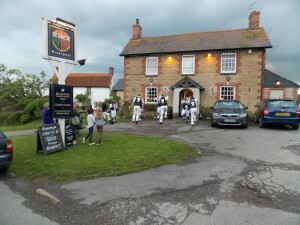 At the Chequers, Charney Bassett. Those cars are uncomfortably close. We were dancing by ourselves that night. Or so we thought. Emily and Omri had other ideas, and after doing Shepherd’s Hey with us decided to have a go at Shave the Donkey. Impressively good for a first attempt! 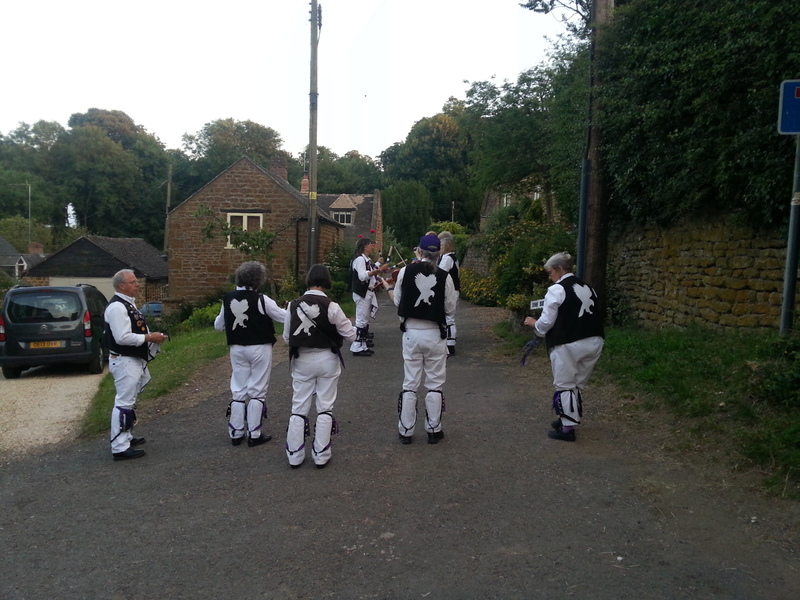 After dancing, in for a session. And our kind hosts presented us with a mountainous quantity of rather fine food. More than we could finish. But we’re very grateful. This entry was posted in Dance Outs on June 1, 2014 by Jim Hague. The weather forecast for our visit to the Chippenham Folk Festival on May 24th had not been good, and for once the weather delivered on the Met Office’s promise. We got rained on. We kicked off at the Rose and Crown. 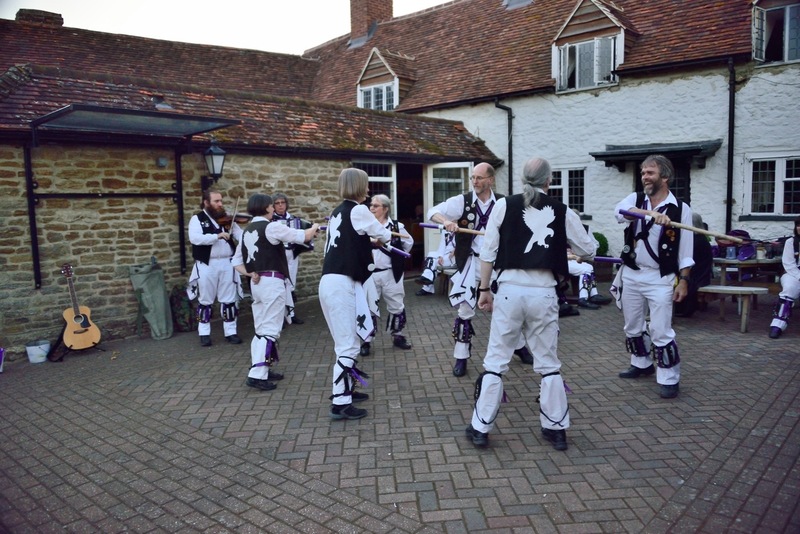 It wasn’t particularly dry outside, so we danced inside. 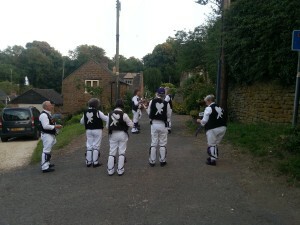 Dorset Buttons Rapper were sensibly of the same mind. 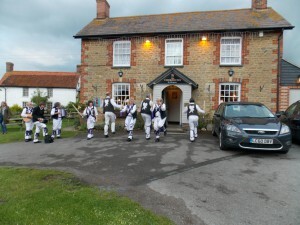 Dorset Buttons Rapper sensibly opt for the inside option at the Rose and Crown. The low beams gave our esteemed Squire a little cause for concern. 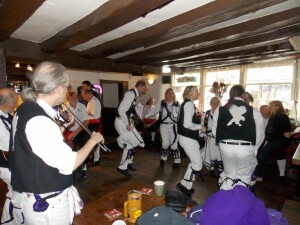 Banbury Bill at the Rose and Crown, Chippenham. Pete is troubled by the low beam. Some others didn’t notice the problem. 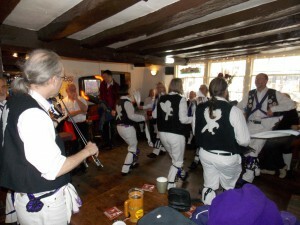 Banbury Bill in the Rose and Crown, Chippenham. Barbara is not troubled by the low beam. 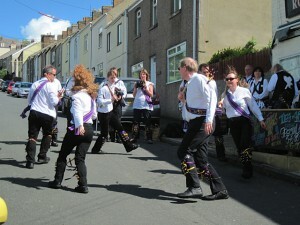 Next stop was the lower end of the High Street, with Cornwalls’ very own Wreckers Border Morris. We got away with a light soaking for our first dance, but for the second dance had to resort to the infamous Sidesteps with Umbrellas. Cry Havoc’s Brolly Sidesteps. 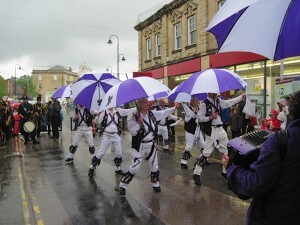 Dancing in the rain at the Chippenham Folk Festival. The Parade down the High Street was threatened with rain that thankfully didn’t materialise. And by the time we turned up for our last spot with Ditchling Morris and Winchester the sun had positively started shining. The sun shines on the Winchester Morris Men at Chippenham. 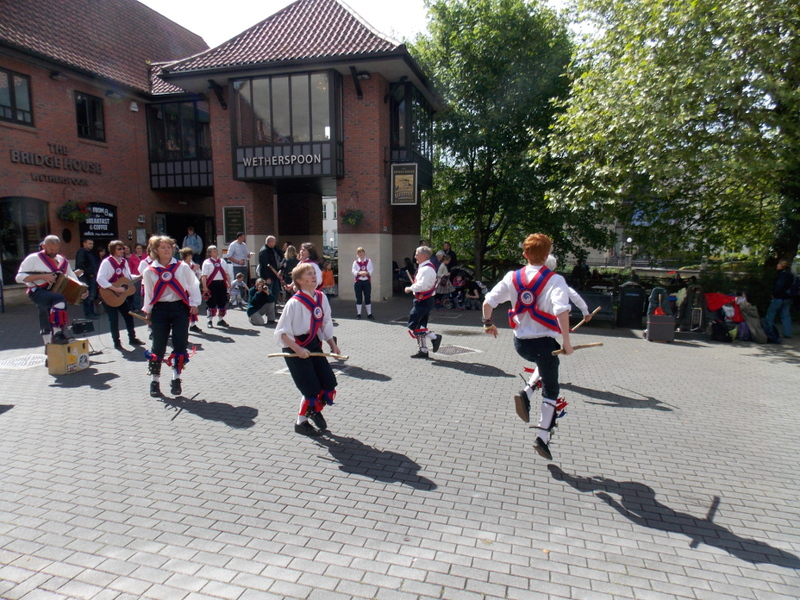 This entry was posted in Dance Outs, Folk festivals on June 1, 2014 by Jim Hague.